CONGRATULATIONS! You have found a TRUE GEM amongst the many Newport Beach vacation rentals! Available year-round as a weekly/short-term vacation rental, our vacation home is OWNER MANAGED and IMPECCABLY MAINTAINED, and just 30 steps to the sand. It's been REMODELED/CONTINUALLY UPGRADED, and is one of the nicest - and certainly cleanest and well maintained - rentals in the area! For the discriminating SMALLER family of SEVEN or less, we offer a great beach vacation experience in a lovely, warm and comfortable home on the Newport Beach Peninsula. With so many Real Estate Agency-Managed rentals on this site these days, we invite you to deal with us as OWNERS/Managers for the very best personal service only an Owner can provide! Read our reviews, see what other guests have to say about us - and read about their vacation experience the "Sandcastle"! Located one house off the beach, and on a corner location, both the INTERIOR and EXTERIOR of the "SANDCASTLE" were completely UPGRADED, to include new kitchen cabinetry & countertop, new bathroom cabinetry/countertops/fixtures, new tile shower in Master bath, new beds throughout, double pane windows and sliding doors (and blinds), mirror sliding closet doors, new cabinetry throughout the unit, a new washer/dryer solely for your use, a flat screen TV and new artwork. On the OUTSIDE of the house, we've redone our stucco for a smooth look, adding architectural features including stone, korbels and shutters. It was wonderful before, and it's even more fabulous now! The 'Sandcastle' is a 'HOME AWAY FROM HOME', with very comfortable furniture and a well stocked kitchen, with HDTV (with Satellite TV/75 free premium movie channels) in the main room - and another flatscreen TV in the master bedroom. Plus there's a large front patio with a terrific brand-new table and chairs, with an umbrella and a gas barbecue, and a partial view of the beach - which extends the living room to the outside of this downstairs Duplex unit. The 'Sandcastle' is decorated in a 'beachy' style, with very nice artwork and colorful accessories. You can be ready to start vacationing from the minute you walk in the front door. Pillows, comforters, mattress pads are furnished, and now bed linens and towels also will be included in our standard Cleaning and Linens Fee. Enjoy a ground floor location and don't be concerned about who's staying upstairs...because it's just the two of us (Don't worry though, we stay out of your way; You'll hardly know we're around...unless you need us for something!) Since it's our house as well, we keep it looking it's best - all the time! SORRY, but we have a strict NO PETS policy. Not inside the house, nor on the front patio either. Located on the corner of Seashore Drive & 35th Street, we're one house off the boardwalk/sand/beach, and you should know that in this area, the distance between boardwalk and ocean is quite narrow (a real positive, very close), vs some other areas where the sand is 3x what it is by us. So that equates to you being very close to the surf at 35th Street, easy and quick to get from the house to the water. Also you're a short 10 minute walk to the Newport Pier and a good choice of restaurants; close enough to the hustle and bustle of activity surrounding the Pier, yet enough away to enjoy a book peacefully on the patio. You're a short drive or bike ride to the Newport Beach Fun Zone, whale watching tours, boat rentals, wonderful shopping, etc. You're also not too far for a day's excursion to other great Southern California attractions such as Disneyland and the California Adventure Park, Knotts Berry Farm, Universal Studios, Hollywood, San Diego Zoo and Wild Animal Park, Legoland, and more! If you're into swimming, surfing, or body boarding, take no more than 30 steps from your front door onto the white sand beach down to the awesome surf that has consistently ranked Newport Beach as one of the top beaches in Southern California. And if you have little ones, the shore is gently sloped, so they can easily get their feet wet and play in the shallow water without being overcome with the waves. When you return to the house, rinse off under our outdoor tile sand shower - or in our new Laundry room shower. IMPORTANT: We will require some basic personal information (Address & Contact Phone numbers) once you book, so we may provide you with a PERSONALIZED RENTAL CONTRACT that you will need to complete and RETURN TO US within a few days, along with 2 Drivers Licenses (for identification purposes). HOW BEST TO SECURE YOUR DATES? - We suggest you email us first through this site ("contact owner") before you put in an automated "Reservation Request" - for starters, and let us know # adults / # children - and ask any questions you may have. That gives us both a chance to make sure that our "Sandcastle" is a good fit for you, and you for us. We have a strict maximum of 7 OVERNIGHT GUESTS - and 10 on the property at any time (incl overnight guests, adults and children combined). - Please note: ONCE YOU SEND AN "OFFICIAL" RESERVATION REQUEST and/or AUTO-BOOK with a CC through VRBO/HA/VacationRentals, we will need to continue to manage your request/reservation through their system, we won't be able to make any changes, and you'll be charged their service fee (payable direct to HA Payments). We are honest and communicative Owners, and we maintain high standards in everything we do! As your hosts and proprietors Bill and Janice, we live in the upstairs unit of the Duplex, and we're about excellence in everything we do! Your vacation home will be ready and waiting for your arrival - impeccably clean with a welcome bottle of wine, so you can just come in and make yourself at home and start your vacation right! There's a book of 'Things to Do' with sights and restaurants we recommend, and we're happy to assist with suggestions to make your vacation truly memorable. Since it's our home too, the property - inside and out, upstairs and downstairs - is so very well maintained. Just 15 minutes from Santa Ana/Orange City airport and 50 miles south of Los Angeles International Airport (LAX), a vacation at the 'Sandcastle,' experiencing our hospitality and Newport Beach lifestyle, will have you returning year after year! HINT: If a more relaxed and quiet vacation is what you're looking for...a well kept secret is that September and October are fabulous, due to the great weather and lessened number of tourists. We're Bill & Janice and we own the 'Sandcastle', and live in the Upstairs unit of this Duplex while renting the Downstairs unit as our Vacation Rental. We're ex-Corporate Executives (now retired) and we've come to enjoy the better things in life - and if you do too, perhaps this is the vacation home you've been looking for! We love to travel, throughout the US and internationally, and here we are recently in Australia by the Sydney Opera House (and on the International front, we've traveled extensively and have been to China, Japan, Singapore, Thailand, Vietnam, Malaysia, Philippines, Europe, Sweden, Argentina, India, Australia, New Zealand, India and Africa in the last 10 years). The "Sandcastle'" is available all YEAR ROUND as a weekly/short term rental, as we do not choose to rent the winter months to college kids - as so many people do in our area - insuring that it is available, and in beautiful condition all year through! During non holiday weeks and in our off-season, we'll even rent the 'Sandcastle' for shorter stays of 3 nights or more. We take a lot of pride in the 'Sandcastle' and do enjoy that our guests appreciate staying in such a comfortable and clean 'home away from home'. We aim to be your go-to Newport Beach vacation home; We have many returning guests, and we hope you'll become a satisfied guest too! The general area is fantastic. The white sand beach and ocean, virtually outside our door/30 steps away, is beautiful. Our location, a ten minute walk on the boardwalk to the Newport Pier, is perfect; It's close enough if you want the hubbub of activity there, but enough away to quietly enjoy a book on the front patio. It's an outdoor lifestyle here at the beach, and we ride our bikes alot, walk/run, grab a beach chair and settle into relaxation on the beach, rent a Duffy boat and cruise around the Newport Harbor. And there's so much to do in the area...There's great shopping and an abundance of both casual and upscale restaurants, and theme parks (Disneyland etc) and sights for our visitors to keep busy. No matter where we travel to (and we've been around the World), we can't imagine living anywhere else, so it's a pleasure to have guests stay at our vacation home and enjoy all that we enjoy! Come live like a local in Newport Beach! We have lived on the Peninsula for 20+ years, and prior to this home, we lived just a few blocks away. It's a great area! We purchased this Duplex to (a) enjoy the fantastic beach and general area ourselves - as we live in the Upstairs unit - but mostly stay out of your way, and (b) provide a vacation rental - Downstairs - that we could oversee ourselves, offering something 'better than the rest', with more personal service. We're available from the time you book until the time you arrive, to assist with any questions or needs you have. We know the area so very well and you can feel comfortable knowing that we can assist with whatever special request you have! (Or keep to ourselves during your stay, if that's what you prefer:-) We love to travel ourselves, and our aim is to provide MORE to our guests in terms of a clean and comfortable, nicely decorated, well maintained rental, and we modeled it after what we most enjoy - and expect - when we travel. Frankly, when we travel, we like to have - as an example - a choice of pillows, nice wine glasses, sharp knives, TV pay per view movies at no charge, an extra tank of propane should it run out, a washer/dryer of our own to use, bedding that smells - and is - fresh and clean, local restaurant recommendations...some of the many basics and extras that we offer as Owner/Managers of our beach vacation home! We have a beautiful white sand beach located here at 35th Street. It's gently sloped at the shoreline for the little ones...and further out we get very good waves much of the year! We're just 30 steps from your front door to the sand. We are located one house off the sand (about 30 steps) and there's a partial view from your front patio (see photos). 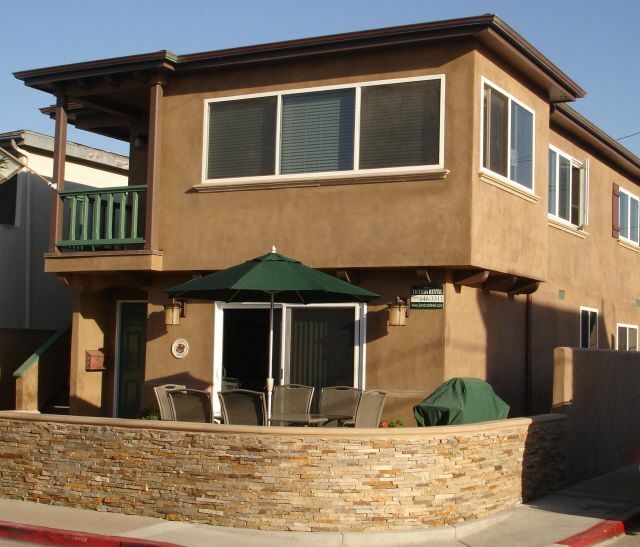 There's a partial view of the ocean from your front patio (see photos) - as we are located just 30 steps from the sand. Yes, Pillows, Comforters or Quilts,, Mattress pads and bed Linens will be provided. Plus your choice of pillows! Secure wireless access at no additional charge. The fastest service that AT&T can provide on the Newport Peninisula. VERY comfortable! Leather sofas/sectionals. It's easy to relax here! Yes! and Dishwasher detergent tabs. a very well stocked kitchen - and new cabinetry and countertop! Nearby. You can rent anything water-related! As Owner/Managers, we personally work hard to make sure you have a great vacation - and try to anticipate anything you'd need! And since we live in the Upstairs of the Duplex - and it's our house too, we keep it really lovely, inside and outside, upstairs and downstairs! It's decorated with very nice artwork and furnishings, much like we have in our own home. There's an outdoor sand shower so you can keep the inside sand-free, and a washer/dryer just for your use. You can bring bikes or rent them nearby, and we have a place outside for you to lock them up (bring a lock!). Ipod player in Living Room. We're always doing 'something' around the house, upgrading, buying new things, making it even nicer! Be one of our satisfied guests and come and enjoy a stay here at the 'Sandcastle'! Amazing location and gorgeous home. Perfect location for our GNO weekend but absolutely want to visit again with the family. So great to relax on the beach but so much to do within walking distance. Property owners are top notch. They take great care to ensure their property is in great condition and want to be sure their guests enjoy themselves. Excellent location and very fair price. I have utilized VRBO many times and would highly recommend this property. Our family of 5 could not have been happier, staying in this beautiful home. The house is spacious, clean, and very comfortable. We loved the front patio, and the large BBQ worked great! The kitchen has everything. And just steps from the beach and boardwalk. We were able to walk to the grocery store, some nice restaurants that Janice had suggested, and a movie theatre also. Janice and Bill were so easy to work with, and they really have a wonderful house in a great location. We have now found our best beach house - after coming to this area over the years - and we will definitely be back. We highly recommend! Had a great time at the Sandcastle. The location is really pretty, close to a beach and boardwalk, but also quiet. Would definitely recommend for people who want a little fun and a little relaxation. Our family had a wonderful time at the Sandcastle. The house is very clean and very comfortable. It was perfect distance to the beach. If our grandchildren needed anything while at the beach we could get “home” in just a few minutes. And there were so many ways to get the sand off of you outside after a day at the beach which was so helpful with our grandchildren. We loved that it is in walking distance to the grocery stores and restaurants. Janice and Bill are very friendly and right there to help if you need anything. This is a great place to stay. Very clean home, super friendly owners, excellent location! The owners communicate with you very promptly. They provide excellent instructions for everything. If you read their instructions, getting there, parking, getting in, finding things... is so easy. The home is in excellent condition, very clean, very welcoming and has everything you need. Can't say enough about the owners, what kind and nice people that really care that your stay is pleasant. So nice to have had your family for a stay, Jessica! So nice to meet you, and glad you all enjoyed yourselves here at our "Sandcastle"! Hope to see you again! Best Regards, Janice & Bill @ the "Sandcastle"
There's so much to do in the area and if you feel like driving a bit...an hour away is Los Angeles, 2 hours away is San Diego; We're so centrally located! We're 30 minutes from Disneyland (even via surface streets) - and so much more! It's a great area for bike riding (mostly flat), so bring your bikes or you can rent them nearby (by the hour/day/week)...and we have an outside area where you can lock them up (so please bring a lock:-). - Kindly email us with any questions before you book...and include # adults/# children - Maximum overnight occupancy is SEVEN, adults & children combined. Maximum TEN (overnight and daytime guests combined) on the property at any time. - No parties, loud noise, vulgarity or large gatherings allowed. - JUNE/JULY/AUGUST 2018, our weeks rent Saturday to Saturday. $3400-$3990 per week - Our vacation home is available ALL YEAR ROUND on a short term basis. Minimum stay THREE nights, except during Holidays, Summer (weekly minimum) and a few other weeks, when a longer stay may be required - Sorry, but we can't allow pets, no matter how small or well behaved:-( - No cigarettes, cigars, vaping or marijuana allowed inside the house. Cigarette smoking and vaping is allowed on the front patio (as long as you keep it from wafting into the house), an ashtray is provided. No cigars or marijuana on the property whatsoever. - At least TWO adults must be MINIMUM AGE 25 - You will be asked to provide the following information so we may email you a personalized Rental Contract: Full name, Home Address & 2 contact numbers. We'll ask you to sign and return within a few days along with two Drivers Licenses for identification purposes. - We look forward to having you for a stay at our lovely "Sandcastle" beach vacation home, just steps from the sand!